Gears of War is first-person shooter game on Xbox. The board game by Fantasy Flight Games had been listed as in-development for several years so it was interesting to finally get it play it. The video game focusses on a small squad of human soldiers (called COG) fighting against an alien race – a lot of the main action involves frantic gunfights, dashing from (or diving over) cover whilst under (and returning) heavy gunfire, and often throwing grenades into large holes in the ground where the enemies are emerging from. 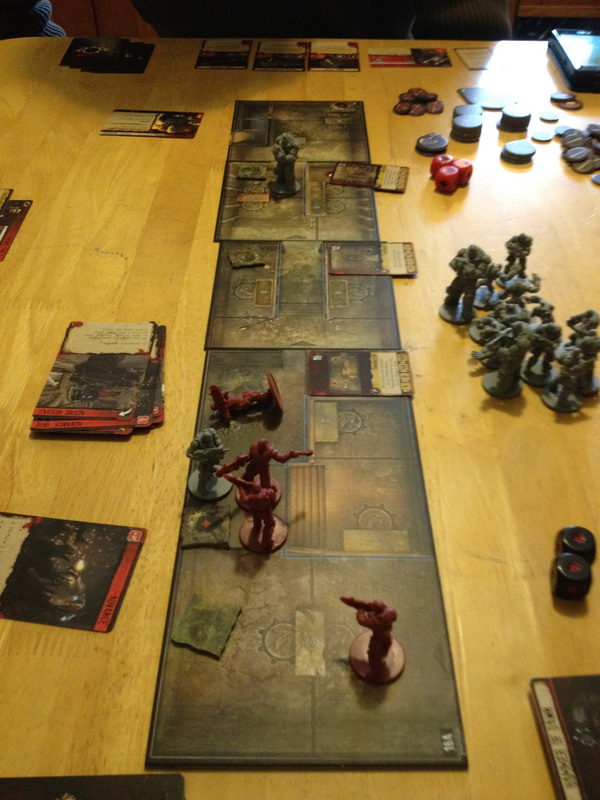 The board game of Gears of War has all the players playing the COG soldiers co-operatively against the game (enemy) and there are various scenarios which determine the map, victory conditions, etc. Also, some scenarios have multiple stages and the players must complete one stage before they next is revealed. The map is made of various tile sections and each is divided into several areas which determine movement and weapon range.